It’s Saturday night at the Confluence. Rico has the night off, but I’ve hired a full staff to meet your needs. It’s 70’s night and all you need is a pair of low-rider bell bottoms. First on stage…Three Dog Night — because Mama Told (you) Not to Come…but you did anyway. Afterwards, the Doobies are stopping by to entertain us for the remainder of the night. This is an open thread…kick off your Earth Shoes, put your Pet Rock back in your pocket, check the status of your mood ring and tell us what crazy things did you do as a teenager that have you wondering today how you survived? Oscar Nominee – Robert Downey Jr.
There’s a metaphor in here looking to get out. If anyone mentions any member of the Kennedy family in this thread they will be thrown to the trolls. As the NYTimes shakes its tiny fists and wails in rage over the fact that Caroline Kennedy didn’t get s Senate appointment, it is simultaneously revealing its true nature and why it is bleeding so much in revenue as the years go by. It’s not that it’s a liberal paper, although they are certainly more left leaning than the Washington Post. And it’s not that it’s too difficult for readers to absorb. The paper seems to be written at the right level. The problem is that there is a complete disconnect between the editors and its target audience. Readers aren’t stupid or less literate. But they are a lot more savvy these days and can tell when they’re being condescended to. Gail Collins goes out of her way to blame everyone in her editorial this morning and take some ungracious swipes at Kirsten Gillibrand because Gillibrand is a real politician who attempts to get votes at rallies where she might influence a voter or two. Horrors! In the refined world of the New York Times, a politician should *never* have to court the voters. Her family name and the policies she was born with should be sufficient bona fides for the voters who should listen to their betters and vote for her. After all, wasn’t that what the last primary season was all about? The powers that be, a group to which no one WE know belongs, shall pick the winner and voters will go along with it. All that primary campaigning was just window dressing to make voters feel like they still have choices. Read Collins’ column. It almost reads as parody. She asks, “…in a state chock-full of distinguished residents, it was so hard to scrounge up Hillary’s replacement?” Indeed, NY is full to bursting with distinguished residents. Unfortunately for Collins, Lawrence O’Donnell and a bunch of other name dropping snobs, what Paterson was looking for was a person who actually liked politics, the people in the state and winning elections. I think we are reaching a tipping point here. What we now see is that we have here a class of people who are shaping opinion and running the country who hold the rest of us in utter contempt. To them, the actualities of living, working, raising children, acquiring healthcare, well that’s all theoretical. They will discuss it amongst themselves and think up pretty remedies that will not inconvenience them in the least. They will pat themselves on the back for all the a priori thought experiments and pass their results down to us as fiats. The vast unwashed masses who use our hands and minds to actually earn a living, the ones who find themselves on the posteriori end of these fiats, will have to do the best we can. And if any of us decide that we want to succeed in politics so that we can make an actual difference, we can be sure we will be derided for getting our hands dirty at state fairs, rallies and parades where we may have to mix with the common man. They were being truthful when they said their hatred of Hillary had nothing to do with sexism. Of course it didn’t. They don’t think of themselves as sexists. Well, ok, so they indulged a little in order to get Barack Obama elected but that’s just because they wanted him to win. It wasn’t sexism. No, the reason Hillary was the old Tracy Flick, while Kirsten Gillibrand is the new Tracy Flick, is because she actually was one of those overachieving ambitious common people who wanted the votes of other commoners. Like they matter. What Barack Obama’s election has shown us is that the only people who matter are the ones you flatter and try to emulate. So, I imagine Obama went out of his way to behave like the snobs at the Times and the Washington Post. What Obama’s election tells us is that snobbery works while Hillary was insufficiently deferential. Of course, now he has to deal with the rank and file WH press corps and it’s giving him fits. But I’m sure that as soon as he figures out that he has to make some of them feel like they are part of some exclusive little club, they’ll come around. He’s already making some inroads there even if there is some initial whining. Give him time and some quail and they’ll be as right as rain and eating out of his hands. Gov. David Paterson and Senator Gillibrand are going to have to kiss up to the powers that be if they want to get elected. It’s just that they *thought* those powers were, um, the people. But the only people that matter are the ones that own the mastheads. Meanwhile, in Ms Kennedy Regrets, The New Yorker’s Larissa McFarquhar wrote what seems like the definitive explanation for Caroline’s demise: she realized she didn’t have it in her even though the courtiers around her were smitten with Camelot nostalgia. Thank you, Caroline. You may go now. The newly elected President has invited this. What is one to expect when people like Pastor Rick are permitted the honor of giving the Inaugural Invocation? When a person says one thing and their actions are completely opposite. I won’t hold my breath waiting for Obama to come out and forcefully reject this completely racist and sexist BS. Over 400,000 have viewed this ad already and millions more are expected to. It would be completely out of character for Barack to take a stand. My bet is that Barack will let it linger so he can continue his game of division for votes? What say ye?? 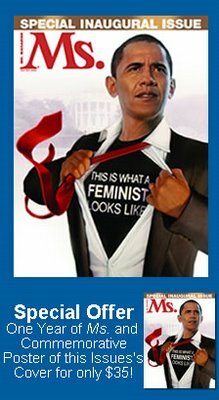 On a side note, one can’t help but wonder if Barack doesn’t speak out against this ad will Ms. Magazine recall their Inaugural Edition? Of course NOT, beanie babies are so much more inappropriate doncha know? Late last year, a group of Afghani girls were attacked on their way to school. At least one was so badly burned she had to be flown to India for treatment. The attackers were arrested and are in jail. You’d think that would be the end of it but the acid throwers and their supporters are still sending threats to the students from their jail cells promising to exact vengeance if any of the arrested are punished. The principal of the school, Qaderi, has been partially successful in getting the 1500 female students to return to class by promising them transportation and security. So far, the students have returned but the buses and protection haven’t materialized and Qaderi is getting worried. The Bushies made Afghanistan promises they did not intend to keep. Like many other projects the Bushies took up, they did a half assed job and left the locals fend for themselves. The world is full of hurts and injustices and the United States is just now starting to feel what that is going to be like with the deepening recession. But we are incredibly lucky that if an American girl wants to attend school. even if that school eventually ignores her and gives her a substandard education compared to boys, she has the means to get to its stingy-assed doors in one piece. Sexism costs. In Afghanistan, it has been very costly as the years of the Taliban has reduced half of the population to a state of illiteracy. If we ever hope to have a stable, prosperous Afghanistan, where reason and education trump superstition and anachronistic tradition, it will require a literate population and the education of girls is critical to this goal. I’m sure that Hillary and Richard Holbrooke know this. They undoubtably have a lot on their plates right now and in the whole scheme of things, the fate of 1500 girls may be overlooked. But it is the small bonds we form that make all the difference, like mending the tears in a complicated lace. It may take awhile to see that the fragments, when joined together, make a cohesive pattern. We have to start somewhere. Let’s start with some girls. Their determination to get an education in spite of Taliban threat is an act of defiance and resistance. If Afghanistan is to be successful at repelling the advances of the Taliban it will be because these girls had the courage to not back down and, as a result, their commuinity had the courage to not cooperate with the Taliban in dragging the country backwards once again. Here’s a bit of history for those of you who remember the 80’s National Georgraphic cover picture of the beautiful Afghan girl. The magazine went in search of her shortly after we invaded Afghanistan. What happened to this promising Pashtun girl who was a learning her letters in a refugee camp in Pakistan? This is her story. Joseph Cannon has flying saucers. Is it true? The Obama Musical is set to make its way from Kenya to Broadway. Hey, at least they didn’t call it Obama Mia! (I got that from some guy on the radio this morning). the ceaseless uproar on the Left undermined[Caroline] politically, so much so that she no longer appeared helpful to Governor Patterson in his bid for re-election. Instead he turned to someone with Upstate connections, someone who supported the person who lost the Democratic nomination struggle; that should be a big help working with the new administration, the one being run by the person she opposed. Another huge plus for True Progressive interests is that she’s as far Right as it is possible to be and still claim affiliation as a Democrat. First, Gillibrand is NOT as far to the right as possible for a Democrat. Maybe try looking at her record. Further, she’s already moderated her stances on social issues, has always been supported by womens groups, and as early as today has been endorsed by womens rights and LGBT advocates. Third, Caroline Kennedy exhibited the political savvy of a watercress sandwich. That’s not the result of a netroots cabal. My Internet connection is struggling and I’ve left off a lot of sites just because I can’t seem to move around very easily tonight. We’re desperate for a new thread so I’m posting this all to short list as it is. But, maybe that’s a good thing. What links do you have to share?